Diamond and Rayvanny in the new song, Mwanza. 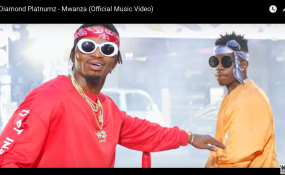 Tanzanian musicians Diamond Platnumz and Rayvanny, together with their record label Wasafi Classic, have been fined Tsh9 million (Ksh400,000) by music regulatory board Basata over their 'dirty song' 'Mwanza'. The fine slapped on the artistes and the record label follows a ban on the issued by Basata on Monday. The regulatory board deemed the song to be inappropriate for public consumption due to its explicit sexual content. The heavy was made after Basata summoned Rayvanny on Tuesday - who featured Diamond on the song - to explain the reason behind the composition of the lyrics. In its reasoning, Basata argued that both Rayvanny, Diamond and Wasafi Classic produced the song despite knowing that it was against Tanzanian laws which protect the morals of the country. Rayvanny, Diamond and Wasafi Classic will each be fined Tsh3 million for going against the law. Speaking after a three hour meeting with Rayvanny, Basata boss Godfrey Mngereza said; "This song isn't good at all. We even asked Rayvanny in the meeting if he can sing the lyrics of the song before his parents and his answer was no. This is a clear indication that even in the singer's eyes, the song goes against the morals." Mngereza also declined Diamond's request for the song to be allowed to air after the watershed period. The singers have been advised to re-edit the song or let it die altogether.